Happy New year guys, I hope everyone had a good one this year. 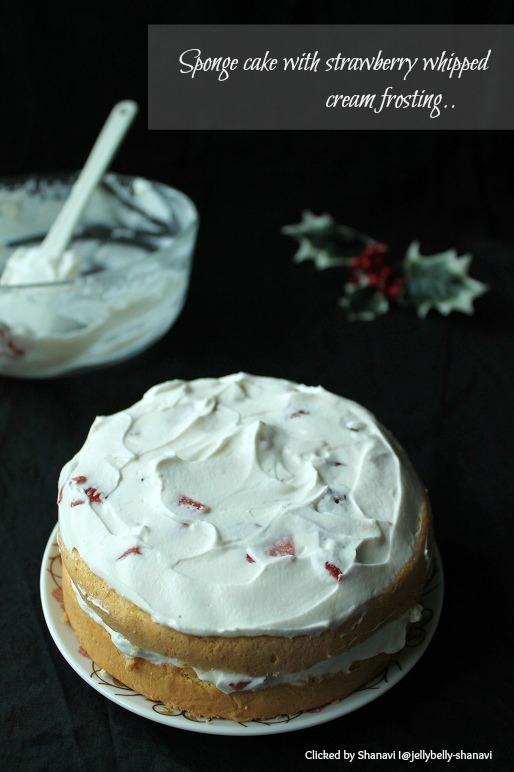 To start with this year's post, I choose this simple cake as it's really moist and yummy with this topping. This year, my kiddo has started going to KG and so my schedules are pretty tight. Also this is the first time I'm away from my kiddo for half a day and that really makes both of us sad, although am happy for him in a way. So, am dealing with lots of crying (both of us :( ) and consoling in these 2 days. I really hope that he would get accustomed to this new environment soon enough..Can't see him crying everyday.. let me not talk about this anymore and off to the recipe now..
** Cake flour substitution for this recipe : Fill half cup of all purpose flour (leveled) and minus one tbsp of all purpose flour, instead add 1 tbsp of corn starch/corn flour. Preheat oven to 350 deg F. No need to grease the pan if it's non stick else grease with butter and sprinkle form flour and tap the pan so that it spreads evenly everywhere. Take out the excess flour. Sift the cake flour with the baking powder and salt, keep aside. Add the egg yolks with 1/4 cup of sugar and beat on high speed until they are pale in colour, thick and fluffy. Mix in the vanilla extract, water and the lemon zest. Beat again to mix well. Keep aside. Prepare the egg whites now. Add the egg whites to a clean bowl and whip until foamy. Add the cream of tartar at this stage, beat until soft peaks form. Now gradually add the remaining sugar to the egg whites and continue beating until steady peaks form. At this stage, the egg whites would be stiff and shiny. Keep aside. Gradually add the flour little by little over the beaten egg yolks and quickly fold the flour with the egg yolk batter. Now add 1/3 rd of the egg whites to the batter and gently fold it with the batter. Then add the rest of the egg whites in rounds and gently fold into the batter just until incorporated. Do not over mix the batter, always fold the whites GENTLY into the batter esle it will deflate and the cake would turn very hard. Pour the batter on to the greased pan to 2/3 of the pan, tap to make it even. Now bake for 28 to 35 minutes. Check the cake by inserting a tooth pick into the center of the cake and it should be clean when u pull out and see. Cool the cake on a wire rack for an hour and start on making ur toppings. Chill the beater/whisk,bowl inside the freezer for 1/2 an hour. Add the sugar to the chopped strawberries and toss well. Keep it refrigerated until further use. 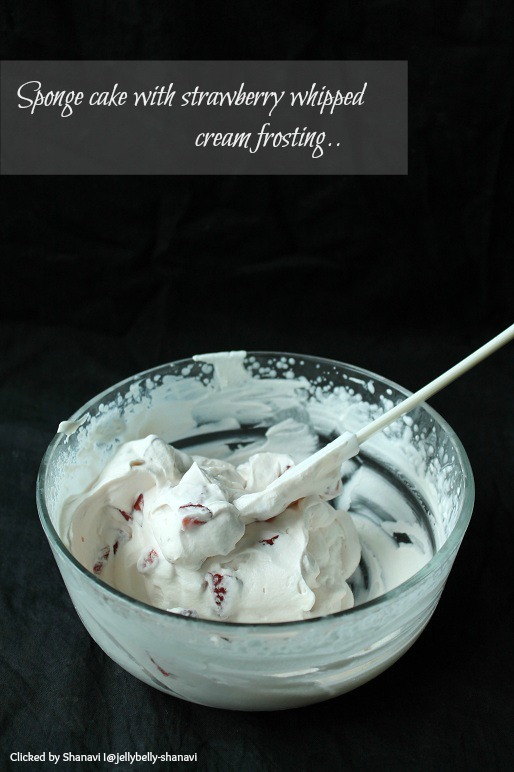 Add the chilled whipping cream, vanilla extract to the bowl and whip until stiff peaks form. Now add the strawberry along with the syrup to the whipped cream and gently fold until just incorporated. Place in the refrigerator. 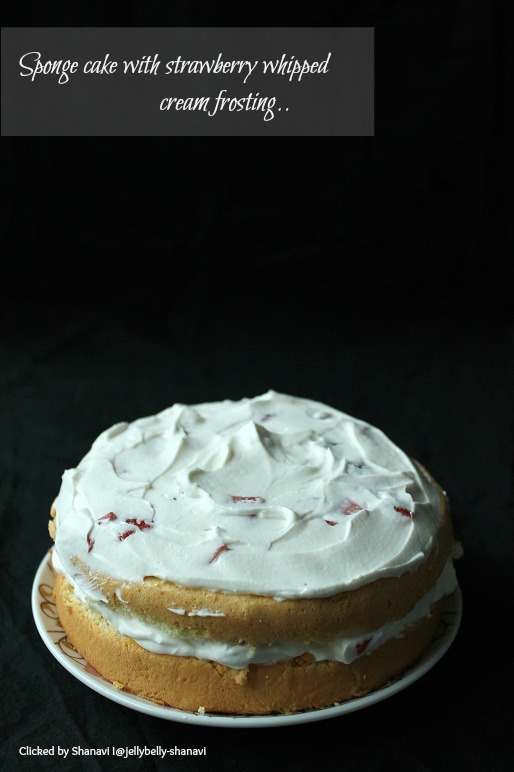 Cut the cake as shown and top it with the whipped cream and level it. Sandwich the other part of cake and again top it with cream just like as shown. Tastes real YUM. This measurement yields a small cake, double the measurements if u need 8" inch cake. Never ever over mix the batter. Always gently fold the egg whites into the batter. 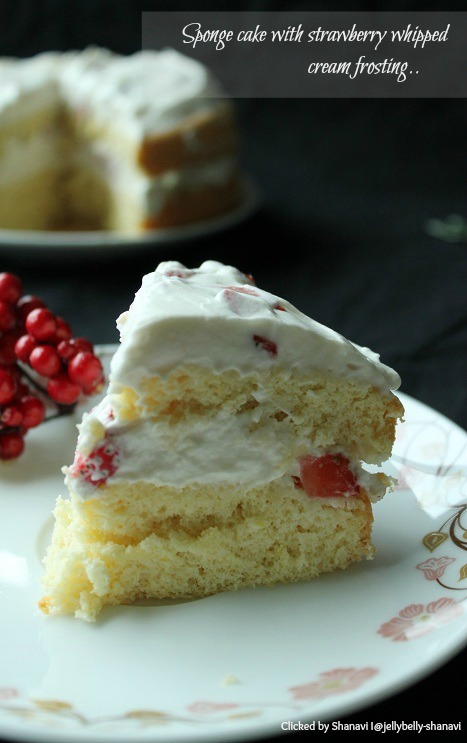 This cake raise so beautifully, so be sure to use a deep pan for baking. After baking, totally invert the pan upside down by placing some support on both the sides to balance the pan. This ensures the cake maintains the same height as it would have been when taken from the oven. Wow cake looks super tempting...luvly clicks too. New yr wishes to u dear,cake looks awesome!! 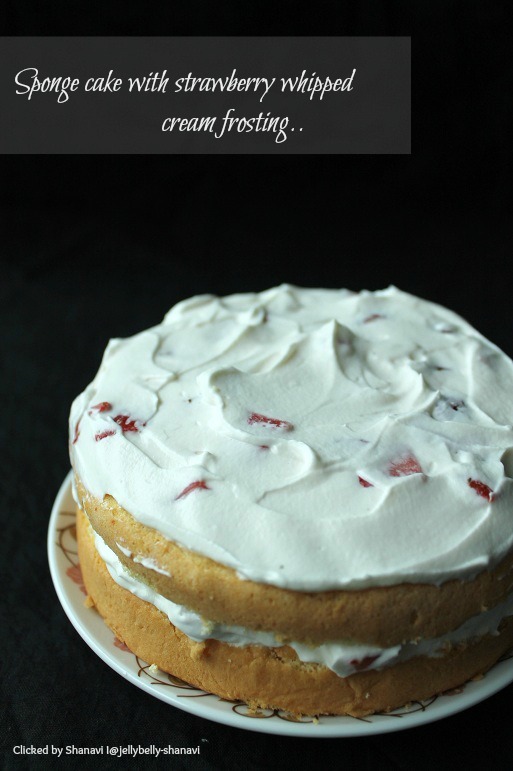 Cakes looks so soft and spongy.. Love the frosting combination too..
Beautiful spong cake, loving that elegant strawberry whipped cream..Inviting slice. woww super duper spongy cake,perfectly made it...New yr wishes to u dear!! sponge cake has come out great.hope Amith gets used to the school. beautiful cliks perfectly done spong cake..frosting luks very rich. Simple to make and great to taste...wonderful..I like it. Really spongy and rich look Sho. Yummy and delicious. what a good idea to decorat cake. first time here. do visit my space too. Wow! Looks super yumm. Can dig into it right away. First time here. Very nice. Wow cake looks superb..loved the use of strawberry in icing..yum..